Okey is a co-founder and Chief Executive Officer of African Capital Alliance (ACA), an investment and advisory company. Having garnered experience in the world’s renowned financial centres of London and New York as well as Johannesburg, he co-founded ACA to promote private sector-led investments in Nigeria and West Africa. African Capital Alliance manages a family of private equity funds with over USD160 million in capital commitments. 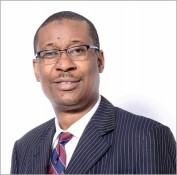 A qualified chartered accountant and chartered financial analyst, he was elected George F. Baker Scholar and designated Loeb Fellow for academic excellence in the area of finance at the Harvard Graduate School of Business Administration, where he earned a Master in Business Administration [MBA] with distinction in 1994. A medical doctor by training, Enelamah’s journey into the world of finance began in 1988 at Arthur Andersen & Co. [Now KPMG Professional Services WA] where he led project teams as senior consultant and audit senior. He went on to work in the New York and London offices of Goldman Sachs & Co. in the summer of 1993, before moving on to Zephyr Management LP in New York as an investment manager. He became a principal at Capital Zephyr, Johannesburg, South Africa between 1995 and 1997, where he worked with the chief executive to launch a $150 million fund for direct equity investments in post-apartheid South Africa. Enelamah, who was President and Chief Tournament Director of the Nigerian National Scrabble Club, was awarded national prizes in ICAN examinations and the Dean’s List of the 1985 graduating class of the University of Nigeria, Nsukka.